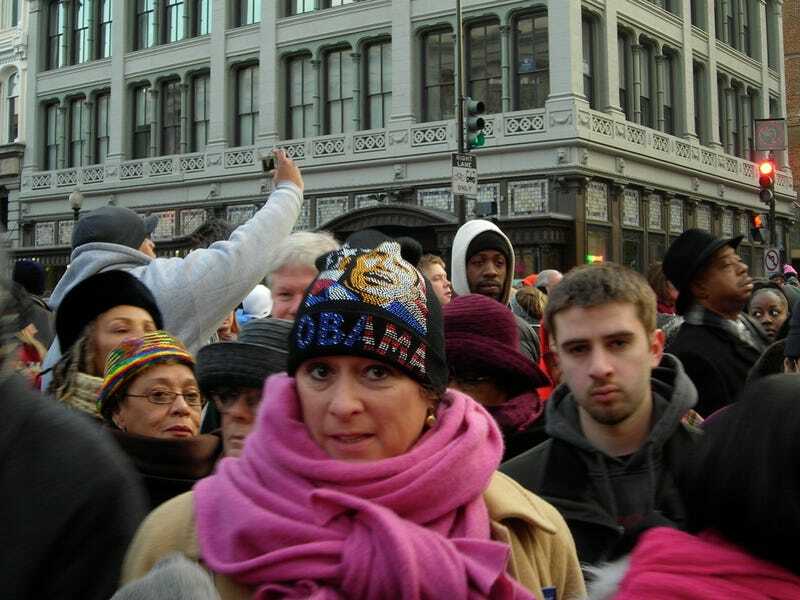 The long and frigid journey to witness President Barack Obama take the Oath and give his inauguration speech as this country's 44th President was worth every chilling minute. Even if I did have to watch from a Jumbo-Tran on the Mall some million or more people away from him. Most of the official entrances to the Mall were not open as I [and millions of others] were led to believe. And it was cold. Most of the millions [some say easily four million] were meandering about for most of the morning trying to figure out an "in" to the Mall. And it was cold. People pushed, people called each other cows, and people were cold. I heard from several passersby that the pre-inauguration was unorganized. There were no signs, most of the volunteers were huddled in one area, and the police kept telling the millions of waiting Obamaniacs that "this gate is closed" or "try the tunnel on Third Street". The madness went on for hours. And it was cold. But then came the Oath and Obama's speech and the crowd [and that includes myself] jumped, wept and screamed. And yes, I was thrilled beyond imagination that change has finally knocked on America's door, but I must admit, as an African-American I was deeply touched. As Obama explained how his African father was denied the right to eat at certain restaurants, and a older black man stood next to me and shouted Hallelujah and then literally cried into his granddaughter's shoulder, a beam of light shined from my soul. He's one of us and he has the ball in his hand! And even though two of my inauguration mates suffered with nausea and had to lie down on the tundra earth and wait for a medic [who never showed up], I enjoyed it. Even once Obama ended his speech and two million found closed exits in four out of five different places when they attempted to leave and it took nearly four hours to get from the Jumbo-Tran to the Metro, I had a wonderful, amazing, soul-shifting, glorious, absolutely charmed time witnessing Barack Obama become this country's 44th President.